Motorola SMS Recovery - How to Recover Deleted Text Messages from Motorola Atrix/Charm/Global? You may have had your text messages lost on Motorola phone for your deleting them by mistake, the unstable environment of the Android system itself, errors in the database in which they're stored, unexpected conduction of message deletion by the applications operating the messages, or use of the "Restore factory settings" function. Losing important text messages will be a big headache for every phone user. As a consequence, it's essential to find a means to perform Motorola SMS recovery as soon as possible. To let you know more about the SMS recovery process for your Motorola phones, I will give you two parts of content to show you how to recover deleted SMS from Motorola phone and then restore the recovered SMS from computer to any Android phone. Why can the text messages be recovered? Why can the text messages be recovered? Isn't it true that they have already been erased? In effect, it's just that you're prohibited from opening them, as the boot area gets closed systematically. Therefore, it seems as if they have been deleted or cleared. You'll be able to find them back, since there still store your text messages within your SIM card, SD card, or your phone, depending on where you have saved them in or have them backed up before. Sometimes, complete deletion of data can only be achieved with special kind of software. What Can the Best Motorola SMS Recovery Tool Do for You? Coolmuster Lab.Fone for Android or Coolmuster Lab.Fone for Android (Mac) is a tool that can help restore the deleted text messages from your Motorola phone with the advantage of having an extremely fast speed of scanning. 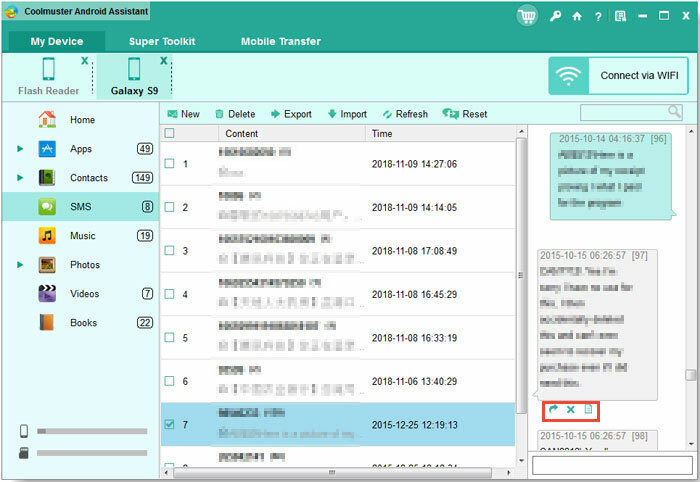 Distinct from other recovery software, it works through the deep scanning function, which can conduct scanning into the deep layer of the data storage card to excavate the deleted text messages, ensuring that the deleted ones are in the recoverable range. Without inputting data into the storage device, it avoids damaging the data twice, making them recover incompletely, or can't be used after recovery. > Not just text messages, it also helps restore contacts, audio, videos, photos, call logs, and others. > It supports restoring Android data for any data loss cases, such as accidental deletion, Android operating system updates, Android operating system rooting, factory reset restoring, etc. > It applies to other Android brands, such as Samsung, HUAWEI, HTC, LG, Sony, MEIZU and so on. Download the free trial to get ready. In the following, we will set Windows version as an example and tell your how to get back deleted text messages from Motorola cell phones by using this professional SMS recovery software. If you are using a Mac machine, such a Windows-based guide is also suitable for you because the operations on Windows and Mac are similar. Have already downloaded and installed the Motorola SMS Recovery on your computer? Ok, you can directly launch it by double-clicking on the program shortcut icon. Use a USB cable to connect your Motorola phone to the computer and then you will see the software automatically recognize and detect your phone. You may need to enable USB debugging on your phone before your perform the recovery. The activated USB debugging is used for synchronizing data between your phone and computer. If you have already opened the USB debugging, you can move to the next step. Or, you need to follow the steps here to learn: how to enable USB debugging mode on your Android phone. After you successfully enabled the USB debugging mode on you Motorola phone, click "Allow" on your phone to allow the program super user authorization when an Superuser Request pops up. Then, the SMS recovery program will show the phone along with its parameter information on the main interface. Tick off the "Messages" tab from the primary interface and click the "Next" button. Then the internal phone memory, SD card and SIM card of your Motorola phone will be all scanned by this software. When the scan finishes, all the contained text messages in your phone will be displayed in list. Preview the scanned out Motorola text messages conversations one by one and check those you want to recover. Then, you can click on the "Recover" button and customize an output location to save the recovered SMS here. Only wait for a few seconds, you will get all you want! By the way, Android SMS+Contacts Recovery is specially designed to recover lost or deleted contacts and text messages from Android phone. After you have recovered the lost data with Coolmuster Lab.Fone for Android, all the recovered text messages will be saved as HTML file on your PC, with the names, numbers and text content are preserved. But how to import the recovered text messages into your device again? Coolmuster Android Assistant could help! What Can Android Assistant Do for You? * Breezily transfer contacts, SMS, call logs, music, videos, photos, etc. between PC and your phone. * Install & uninstall apps from computer. * Import, export, delete and refresh Android call logs. Please download the Android Assistant program by clicking the download button above and then launch it on your computer. Then, connect your Android phone to the same computer via a USB cable. 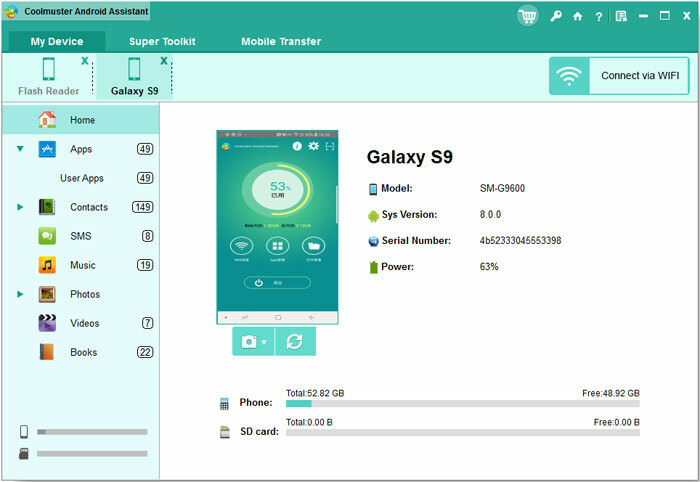 Once the connected Android phone is successfully detected by the Android Assistant, you can see the data on your device are displayed on the left pane of the interface. Please click "SMS" > "Import" button and you can choose the messages you want to transfer to your Android from your computer. With Motorola's becoming world-famous for its tremendous innovation and amazing leadership in both wireless and broadband communications, it's recognized as one of the world's big three communications enterprises in addition to Nokia and Ericsson. Last week, Motorola launched a "fantasy-class" Android system model called Moto G, a mobile phone not only at an extraordinarily low price, but also with fairly good performance as well as a 4.5-inch display, which's highly representative of Motorola's mobile products. Its cost-effectiveness is the major reason drawing consumers towards purchasing and explains why its phones are loved by numerous people across countries. Do you also think that the recommended method for recovering lost Motorola text messages is as simple as amazing? I want to reiterate that Coolmuster Lab.Fone for Android supports all Android phones to recover lost text messages. If you can recommend the tool or this article to your friends, we would be grateful.